Being Empathic makes you highly sensitive to the energy around you which naturally tends to make you withdraw socially. 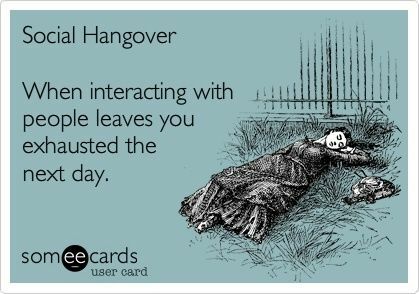 Introverts are often associated with being unsocial. I have a theory that being Empathic causes introverted characteristics. I created a few polls in some spiritual communities where people identify as Empathic to test my theory. Unfortunately, instead of identifying as either introverted or extroverted most people said they were somewhere in between. DOH! One person claimed to be an extroverted introvert. I suspect this is because there are many misconceptions about being introverted or extroverted. Extroverts get energized from other people. They tend to shut down when they are alone. Introverts get energized by being alone. They get drained being with other people, which is the epitome of being an Empath. I want to know the correlation. Does being introverted lend itself to developing Empathic abilities? Or is it the other way around, Empathic abilities cause introversion? Is it even possible for an extrovert to be Empathic? Personally, I think because introverts are naturally introspective, they are more observant than extroverts. This makes it easier to pick up on little cues that may be going on with others, for example, knowing when something is wrong. I'd consider many of the extroverts I know to be emotionally oblivious to others. For example, they seem to have absolutely no clue when it's time to call it a day because they've drained you of all your energy. They're just ready to go on to the next activity. In fact, most extroverts I know are completely clueless to the needs of their introvert counterparts. They don't seem to understand us at all. Being an introvert is not something we need to overcome. Our energy levels are not the same as there's and we're not sick! Isn't this a complete lack of empathy all together? Whereas, introverts know we are going to be making a sacrifice to hang out with an extrovert and what it entails. We also know when extroverts are trying to stay busy running around planning endless activities in order to avoid feeling negative emotions. We can appreciate that and sometimes we're willing to help you out with that. I hate when people think I'm shy! Being quiet and being shy are two different things. The only feedback I ever received from any of my teachers growing up was that I was too quiet. Well that's because being around so many people causes sensory overload and shuts us down. We're highly distracted by background noise. If we don't speak up in class it's because we are in shell-shock. I am usually pretty quiet around those I sense have dominant or intense energy. I don't want to exert my own energy to overcome there's or let them have any of mine. When we're quiet we're usually collecting data and making calculated decisions. While we do get energized by being alone, we actually do like to hang out with friends. We aren't going to be up to just hang out with anyone we happen to have commonalities with i.e. co-workers, family, classmates, neighbors, etc. We know people's intentions. We want to hang out with people that actually want to hang out with us personally, not just someone/anyone to do something with. We don't want to hang out with people when it's only convenient for them. We want a real connection. I've always picked out the people I wanted to be friends with before ever even speaking to them. I can read their energy and know if they are somebody I want to be around.